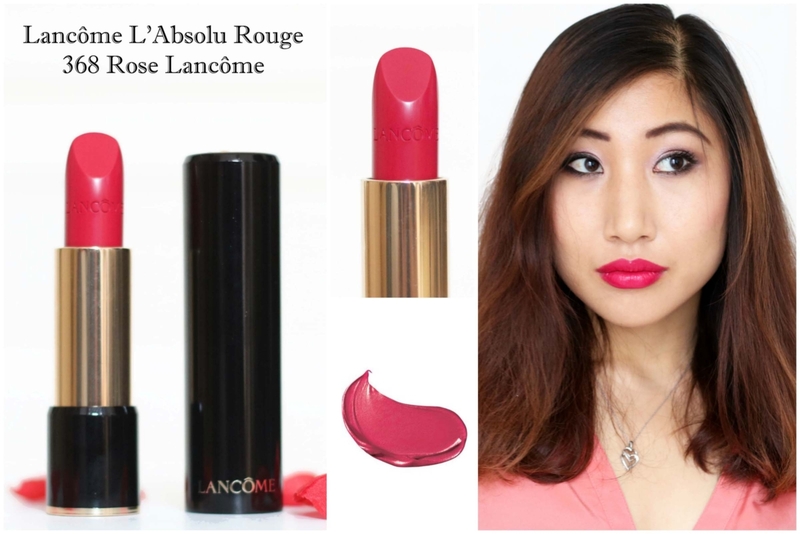 Lancôme L’Absolu Rouge comes in 36 different shades. 202 Nuit & Jour is lightest shade (Lisa Eldridge’s favourite) and 368 Rose Lancome is one of the brightest and most iconic shades (Lily Collin’s favourite). From the two, I must admit that Lancome Nuit & Jour is my favourite due to the neutral colour which I can wear on daily basis. Lancôme L’Absolu Rouge in 36 shades pretty much covers the whole spectrum of lipstick shades from nudes, to reds to pinks! The shade I have here is 368 Rose Lancome which is classic bright pink shade. It’s so bright, it’s almost fluorescent which really puts the focus on your lips! The colour is most similar to the iconic and most recognisable rose from the Lancome logo! The texture of Lancôme L’Absolu Rouge lipstick is not the same for all shades as it comes in 3 different make-up finishes; Sheer, Cream and Matte. 368 Rose Lancome is a cream lipstick, and it feels super smooth and moisturising upon application and it even looks good on chapped lips. The coverage is incredible, but you may need to use a lip pencil and lip brush for a flawless finish. The colour is long-lasting, but it does stain on glasses. Nevertheless, because of the strong colour the intensity doesn’t wear off from drinking only. The colour only comes off if you eat a big meal and drink at the same time (as expected of all lipsticks). Even so, it leaves a pretty subtle pink stain which looks like a more natural looking pink lipstick as opposed to looking patchy. Basically, it wears off nicely! I love this Rose Lancome shade, but I don’t think it’s something I’d be wearing everyday as I don’t often wear bright rosy colours. Hence, I don’t actually have many lipsticks in this colour spectrum… but I think this needs to change! Rose Lancome would be a really gorgeous colour to wear in the summer and it also look very pretty in photos. Previous Post Look Party Ready with Jones and Jones!